Operatically, Connolly is something of a late developer. Unusually for a female singer, she is unfazed about admitting to her age — 41 — but this may explain her maturity when she first appeared on the scene, and her survival in a notoriously difficult theatre for young singers. She began her career as a concert and choral singer. As soon as she left the Royal College of Music at the end of the 1980s, she joined the BBC Singers, an acknowledged training ground for future soloists. "It's how I earned money to pay the rent," she says "and it's a very enjoyable way of working. I was also singing with Harry Christophers (The Sixteen) and John Eliot Gardiner (Monteverdi Choir) — I am in his recording of the Verdi Requiem. I did quite a few of The Sixteen's recordings as well." At college, she had not really set her sights on a career in opera. "It sounds banal, but I was interested in harmony and contemporary music," she says. "The BBC Singers did wonderful ensemble work, which is what interested me at the time. We did Messiaen and Ligeti. At the height of my sight-reading skills, I managed to master the alto line of some difficult Ligeti. I thought I'd busked my way through it, but my colleagues were impressed, and most of the notes were in the right place. I couldn't do it now." 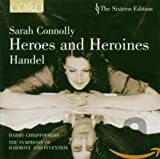 Connolly clearly has an innate intelligence — her distinctive warm, bright-sounding mezzo has always been at the service of musical ends, her intonation is well-nigh perfect and she cares about words. Even as a beginner, she possessed the all too rare self-knowledge that is vital for a long, successful career. "In the 1990s, my voice wasn't particularly big, and I thought it was safer to start with the baroque/classical route," she says. He mentions that she has appeared in New York, but I have yet to hear her (mostly my fault, as far as the recordings she has released). What do you know? She also released a Handel CD in 2004, which Canning says that she "partly financed herself" (on the Coro label, with Harry Christophers).